Fantasy Flight Games is proud to introduce Andrew Navaro as the new head of Fantasy Flight Games Studios! Andrew took over the position at the start of 2017 and is responsible for overseeing product development from concept to completion. 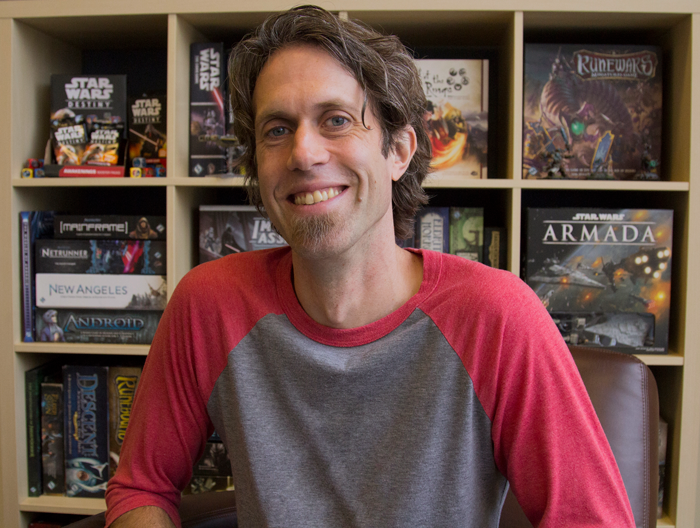 A 13 year veteran of Fantasy Flight Games, Andrew is dedicated to giving gamers new experiences by pushing the boundaries of what's possible in board gaming. Andrew took time out of his schedule to talk to us about his past, present, and future. FFG: Let’s start with a little bit of background on yourself, a brief description of who are and your history with FFG. Andrew Navaro: I started at FFG in late 2004 as a customer service associate. I was responsible for answering the phone, parts replacement, replying to general customer service emails, and for providing organized play prize support. About a month or so into the job, I learned that a graphic design position was opening up, so I went to the senior graphic designer at the company and told him I was interested. Prior to working at FFG, I had done some freelance illustration, and I’d done a fair amount of graphic design in the past, but it was more commercially focused, and I didn’t have a graphic design portfolio readily available. Christian Petersen, the FFG CEO at the time, wanted to see my portfolio on the following Monday, but I had nothing to show! As soon as I got home, I sat down and spent every waking moment of the next 48 hours creating a “portfolio”—I designed an RPG book cover and interior and built a mock box of a fake game that I glued on the outside of my copy of War of the Ring. Monday came around and I met with Chris to show him what I had. He must have liked what he saw because after a short deliberation, he decided to give me the job. I worked for almost six years as a graphic designer. In 2010 I was offered the opportunity to become the Managing Art Director, which made me ultimately responsible for procuring all of the art for our games. My change in position marked the official formation of the Art Department at FFG as we pulled all of those responsibilities solely onto the art team (which consisted of me and two others). The majority of the systems that we put in place to help facilitate art procurement are still in place today. In 2014 I moved to our digital team as the Digital Creative Director and worked on XCOM The Board Game, Mansions of Madness 2nd Edition, Descent: Road to Legend and Battlelore: Command. I learned a lot during my stay on the digital team; most importantly that software development is deceptively difficult! I have great respect for our programmers. They make amazing things happen. After a couple years on the digital team, I moved back to product development as the Vice President of Creative Development. In that role I headed up all of the creative service departments (Art, Graphic Design, Sculpting, and Fiction), and it was my first experience managing managers. In everything we do, constant and clear communication is extremely important, and in managing managers, the importance of communication is amplified. None of the success that FFG has achieved would have been possible without all of the amazing staff working together to make our games great. FFG: What do your responsibilities include now? AN: Currently, I’m responsible for overseeing all aspects of product development from concept to completion. I’m still heavily involved with the look and presentation of our products (meaning the art, sculpting, and graphic design), but I now also have to make sure that our games are fun! Thankfully, I’m surrounded by incredibly talented, creative, and dedicated staff who care as much about the quality of our games as I do, so I can always count on them. It’s just up to me to help push the quality as far as possible given the time and resources at our disposal. I’m also the head administrator of the Studio, and that involves a lot of planning, meetings, emails, phone calls, and spreadsheets. FFG: What’s your gaming history? What are some of your favorite games? What personally attracts you to a game? AN: My earliest exposure to games was playing cabinet arcade games in the late 70s and early 80s like Centipede, Defender, and Pac-Man. My parents would let me tag along to their weekly bowling leagues, and I’d spend my time at the bowling alley either playing or pretending to play the games there. Right around 1980, I remember visiting a friend of my mom’s who had a daughter that was a few years older than me but was accommodating enough to entertain me whenever we came to visit. She had an Atari 2600 and a copy of Adventure!—a super-simple dungeon exploration game where you played as a colored square with a line of pixels for a sword. You could do battle against a dragon that I always thought looked more like a duck than a reptile. She also had a collection of Dungeons & Dragons books that I would leaf through every time we visited, carefully examining every illustration on every page. In the Christmas of either 1980 or 1981, my mom gave me the original D&D basic box as a gift that came with a set of yellow polyhedral dice and a black crayon for filling in the numbers, a three-hole punched rulebook, and The Keep on the Borderlands adventure module. I loved that box. I ended up getting a few other modules and a couple other books including the AD&D Monster Manual with the red dragon and pegasus on the cover (which is still one of my favorite fantasy illustrations), but I never played the game. I just dreamt of playing. The rules were too complex for me to follow, and I didn’t have anyone in my tiny neighborhood who was interested, but I made some characters and spent a lot of time drawing creatures and heroes inspired by what I saw in those books. In high school, I finally had the opportunity to play tabletop games regularly with my friends. We played a lot of Axis & Allies and some Fortress America, but in my sophomore year of high school, I bought a copy of Blood Bowl 2nd Edition, and that launched me into a completely different realm of gaming. I instantly got very into it. I bought paints and started down the rabbit hole of miniatures painting. I bought every team I could get my hands on (they were really hard to find! ), and recruited a bunch of people into a league that I ran for a couple years. I wrote a league newsletter complete with illustrations and in-world game reporting. I played precious few games in college, butwhen I was out on my own, I played Bioware’s classic crpg Baldur’s Gate, and suddenly the AD&D rules that I’d found too intimidating and complex as a child made perfect sense to me. Nearly 20 years after I’d received the D&D basic box for Christmas, I finally started playing. A few short years later, D&D 3rd Edition was released, and I was completely hooked. Roleplaying has been the most constant presence in my gaming life, and I still play in a regular group with the same friends I played with fifteen years ago. In the interceding years, I’ve played and enjoyed a lot of games from Magic: The Gathering to Warmachine to Star Wars™: X-Wing to Android: Netrunner. Lately I’ve been playing a lot of Splendor and Skull with my friends and family. I also love playing games with my kids—Gently competitive games get the most play with my boys; Ticket to Ride, Dungeon, Caverna, and Scythe have all hit the table in the past year. What draws me to a game is theme and the look of it. I’m a sucker for a good looking game. When I see a beautiful game with a well-implemented theme, I can’t help but get excited at the prospect of adding it to my collection. FFG: What’s something special you bring to the position? AN: I think what I bring, first and foremost, is experience. I’ve worked in the industry for what feels like a long time, and all of that time I’ve spent here, at FFG, watching the industry and our company grow by leaps and bounds. I’ve worked in a lot of different capacities and understand the complexities and challenges of product development from multiple perspectives. That gives me the ability to relate to the staff in a very meaningful way. I understand from experience what it’s like to receive and implement feedback given by executive staff, so I know how to provide feedback in a way that gets us to our goal as quickly and effectively as possible. With all the concurrent projects we have, the less back and forth there is, the better. FFG: What’s your philosophy when it comes to your job? AN: I feel as though Im still forming that philosophy, and it will likely never be something that’s completely solidified. Generally speaking, I see myself as a curator of ideas. We have a very creative and intelligent staff and they have tons of great ideas all the time. It’s up to me to decide which of those ideas align best with the studio’s goals and the expectations of our customers, and thereby make their way into our products. I want FFG to be a place where creativity and invention are encouraged, where everyone feels as though their ideas are being heard and considered, even if those ideas never make it to market. FFG: Do you have examples of how this philosophy has impacted upcoming and recently released games? 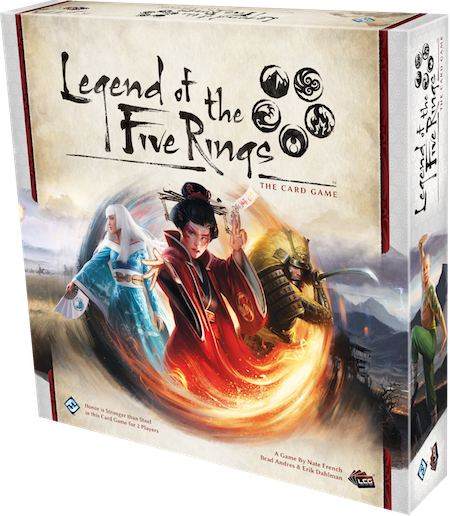 AN: One product line that has been announced that falls into this category is the Legend of the Five Rings LCG®. 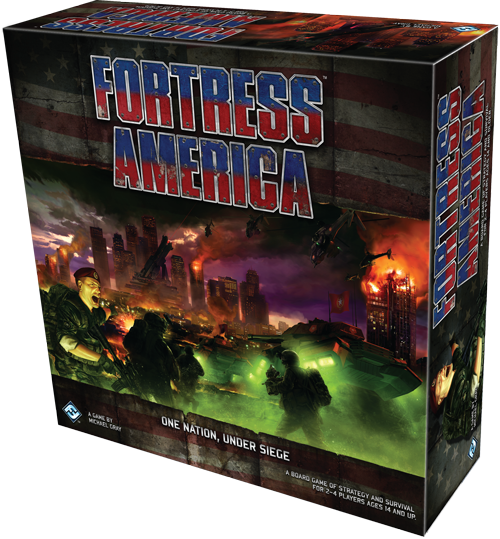 There are a lot of people here at FFG that care very much about that game and the property. As a result, there were a lot of ideas internally as to the best way to approach relaunching one of the most popular and successful collectible card games of all time. In helping to guide the game’s development, I had to weigh a lot of opinions and work to satisfy a lot of interested parties. In the end, this game is an amazing culmination of a lot of hard work from design, to graphics, to art, to fiction that satisfies all of those interested parties without feeling like a bland rehash of what came before or something that is completely unrecognizable. I think it’s awesome. I hope the fans do too! FFG: What are your short term goals for the FFG studio? Long term goals? AN: My short term goals for the studio have already been accomplished. We had a lot of projects that needed to be completed in the first half of 2017, and when I became the head of the studio, I knew that I couldn’t start things off by missing a bunch of previously established deadlines. Seven months in, I can proudly report that that promise has been fulfilled. Now, those games just need to come out! Long term, I’m looking forward to building on the great success of FFG, to continuing to be a valuable licensee for our great partners like Lucasfilm, Middle-earth Enterprises, Bethesda, 2K, and George R.R. Martin by making lavish, richly themed games that push the boundaries of what most people expect from licensed products by creating great experiences that engage customers with those IPs in a way that’s only possible through tabletop gaming. 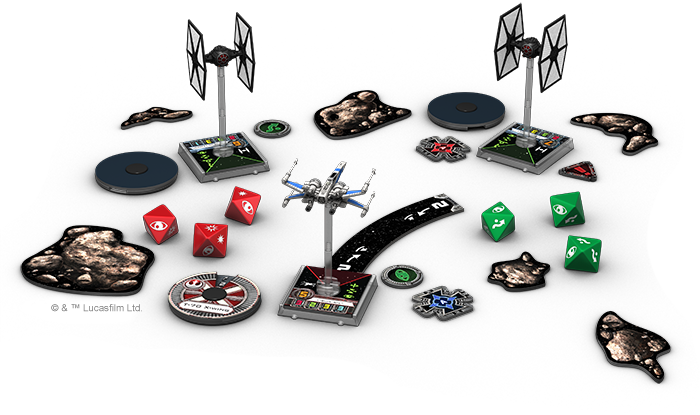 While great licensed games is what a lot of people think of when they think of FFG, that’s not all we’re about. In the past couple of years we’ve made great strides toward strengthening our own intellectual properties, and we’re going to continue to do so in the years to come. Fans of our settings (Arkham Horror, Runebound, Android, Legend of the Five Rings, etc.) can look forward to more world building, more fiction, and (most importantly) more games that explore those settings in new and interesting ways. 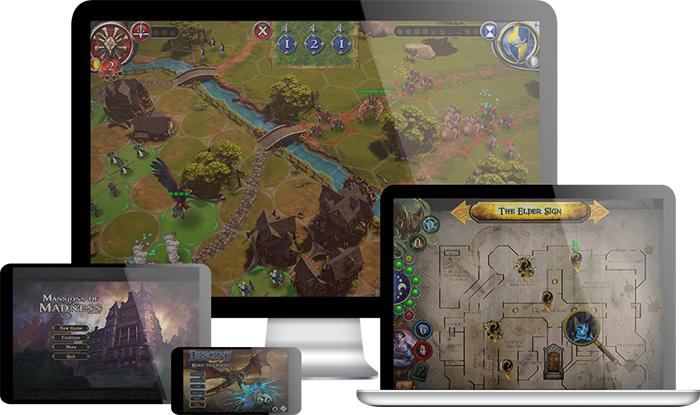 Lastly, we will continue to innovate and improve on the tabletop experience whether through app integration or inventing completely new categories of games where we can expand the public’s perception as to what’s possible in tabletop gaming. Every day I look forward to working with everyone here at the studio. The only downside is that we have to wait so long for our fans to get their hands on what we create!